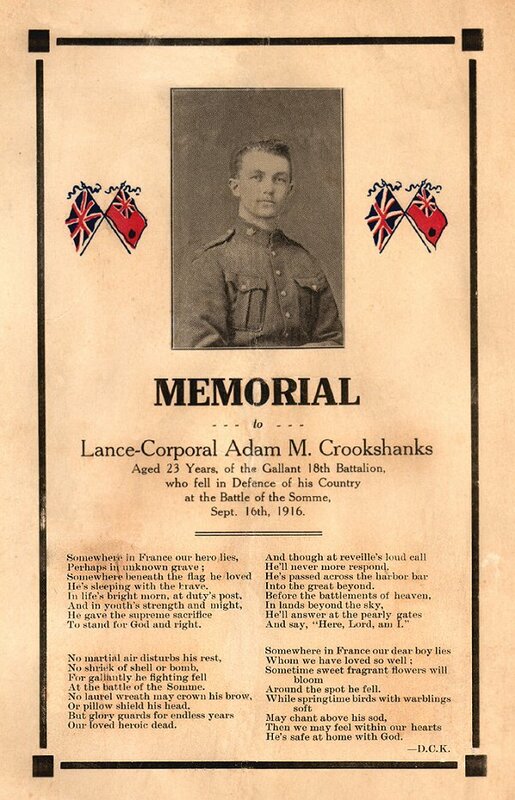 Crookshanks Photo Description Newspaper Clipping – Original memorial notice for Lance-Corporal Adam McKee Crookshanks. His story was featured in Maclean’s magazine in its December 1917 issue. 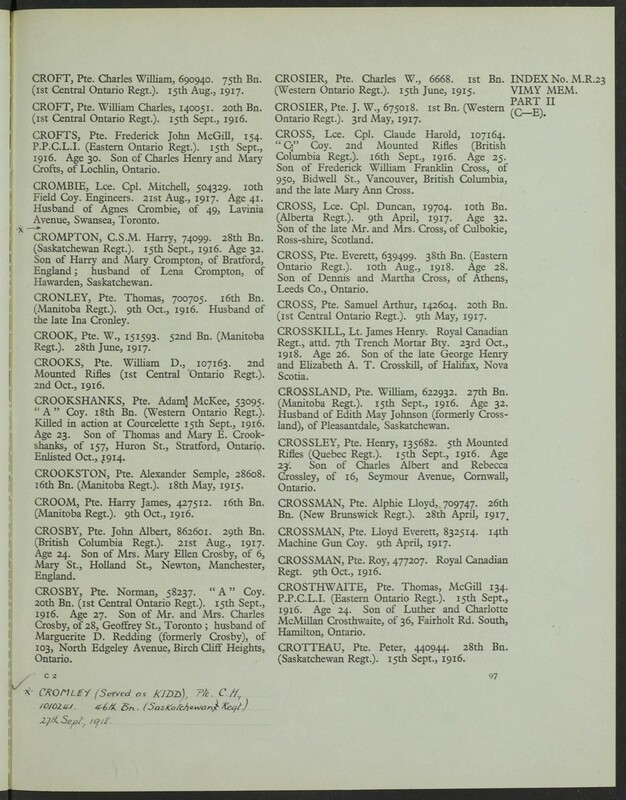 The author of the article was Corporal R. N. Siddle who fought with Crookshanks in the 18th Battalion. The article detailed the growing importance of the role of the sniper during the war and the hardships faced by snipers. He described Crookshanks in the article as follows: “He was a fine fellow, big and husky, and good natured and as straight as the day is long. We had enlisted together and had been the closest of chums all through training. We worked together as a sniper team for over a year…I want to say that a better man than Adam Crookshanks never donned the khaki.” At the battle of the Somme, Corporal Siddle was with Crookshanks when he was killed and wrote: “Death was probably instantaneous. The German had shot him in the neck.” Siddle buried Crookshanks in a shell hole. This article remains as a lasting tribute to Lance Corporal Crookshank’s heroism. Friend and sniping partner to Corporal Richard Norman Siddle, 54309, he perished during The Battle of Fler-Courcelette. 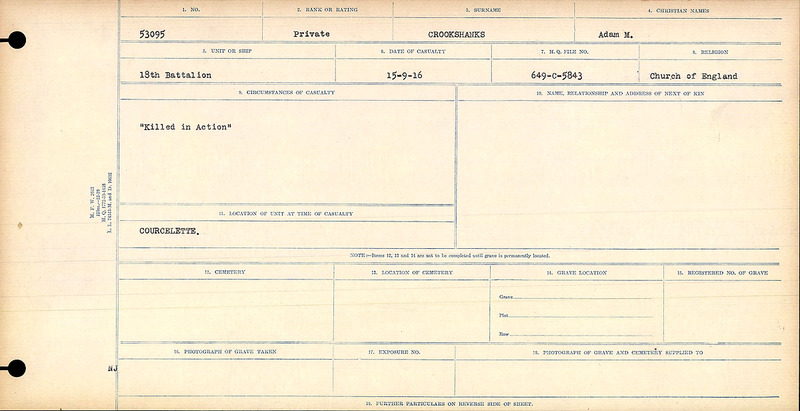 Hear his letter to Private Crookshanks’ parents by listening to CBC’s Letters from the Front. It is valuable to listen to the entire show but the letter specific to this soldier is at the 28 minutes and 30 seconds. I have very sad news to tell you. Your son was killed in action on the 14th of September and all the snipers send their deepest sympathy to you. You son died a soldier of the Cross and a man and he was well loved in the Battalion. Your son and I were snipers together ever since we landed in France and I miss him more than anybody else in the Battalion. They couldn’t fetch your son’s body out as the gun fire was too heavy so they buried him where he was killed. We took off his ring and some of his personal effects to send you. I hope you receive them safely. I hope this dreadful war will soon be over. I again send you my deepest sympathy.